These Champagne Bubbles are that favor! 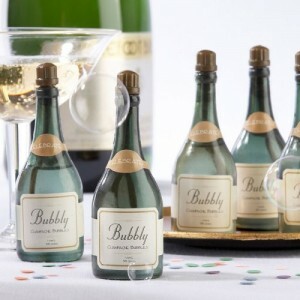 The mini champagne bottles come with screw top lids and are decorated with a “celebrate” neck label and a “Bubbly Champagne Bubbles” label on the front. These bubbles would be great for guests to “pop” at the end of the ceremony or at the end of the reception. They’d also make a fun take-home favor. The bubbles are a fun and festive way to celebrate your big day! You can find these fun wedding favor bubbles here.